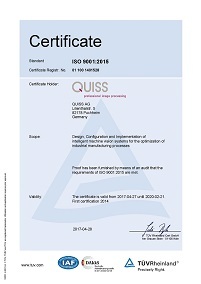 Since 1988 QUISS GmbH is a reliable partner for development and implementation of professional turnkey image processing solutions. With their excellent technologies and algorithms, the QUISS systems provide a real competitive edge in industrial production and offer a decisive contribution to highest quality and productivity. Our image processing systems are operating successfully worldwide in many industries. We orient ourselves to the needs of every individual customer. We design and integrate our systems to your special requirements and provide comprehensive service during the entire project – from initial concept to startup and follow-up service needs. We train your employees thoroughly and provide a full spectrum of service offers after project completion.